While the date may vary slightly from year to year, the summer solstice, also known as midsummer, officially marks the first day of the summer season. The summer solstice occurs when the orbit and axial tilt of the planet positions our hemisphere closer to the sun than at any other point during our yearly trek around the big ‘ole fusion-furnace we sometimes call Sol. As a result of this cosmic positioning, the summer solstice is the longest day of the year, and ancient cultures have long recognized this neat little piece of astronomical trivia. Traditionally, the solstice has been a time to celebrate the coming of the crops, light bonfires, and, until the Church ruined it, engage in merry-making. It was in this rich tradition of celebrating nature and the verdant bounty she provides that, instead of the normal, sit-down affair that characterize most of The Homegrown Revival dinners, The HGR Team decided to hold its final event of the spring season as a picnic in Butler Park on Midsummer’s Eve. When we arrived at the park, The HGR Team had already set up a serving table on top of a small, grassy hill, and several of the Revivalists had laid their picnic blankets on the ground. The HGR Team greeted us warmly, and then they set about mixing up our aperitifs, which they called “Spicy Greyhounds.” For the uninitiated, a “Greyhound” consists of vodka and grapefruit juice. A “Spicy Greyhound,” as The HGR Team jovially explained, contains a muddled slice of jalapeno, which definitely kicked the whole thing up a notch. 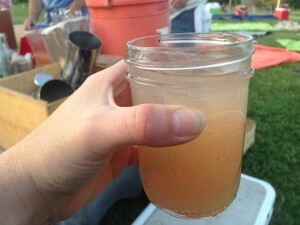 The final product contained Texas grapefruit, Dripping Springs vodka, and slices of muddled jalapenos from Springdale Farm. Since a line of thirsty Revivialists had begun to form, Tink Pinkard decided to join in and help make the drinks. Noticing that the singular muddler was currently in use, Tink decided to improvise, just as any outdoorsman worth his salt would do. 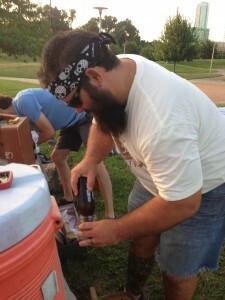 So he grabbed an unopened beer bottle, flipped it upside down, and proceeded to use the cap to muddle away like a madman. You can’t repeat the past? Of course you can! We took our drinks and sat on our blankets, and before too long, The HGR Team brought us our dinner in a beautiful picnic basket. 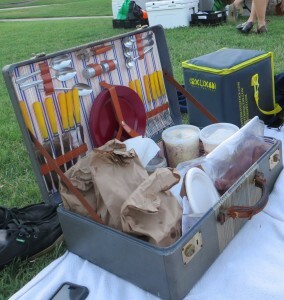 The picnic baskets had come from Shuford Alexander, a vintage luggage restorer in East Austin. I have to say, those cases were magnificent. One of our friends said our basket made him feel like Gatsby, and I had to agree. Just having it on our blanket brimming with food upped my gentleman quotient by an order of magnitude. Just look at that thing. Isn’t it gorgeous? Since this dinner didn’t have service, we got to choose the order in which we ate our dishes. We started with the potato salad that the chefs had made with potatoes from Springdale Farm and Urban Roots. Four egg halves rested on top of the salad, and we greedily spooned it onto our plates. Next we moved to the squash salad that had also been sourced from Urban Roots. The tangy crispiness of the squash dish did a nice job of complimenting the smooth taste of the potato salad. We also had a mason jar filled with a cool and crisp shredded cucumber salad that I simply couldn’t get enough of. No Joking! These are serious business! After exploring the veggies, we moved to the proteins. 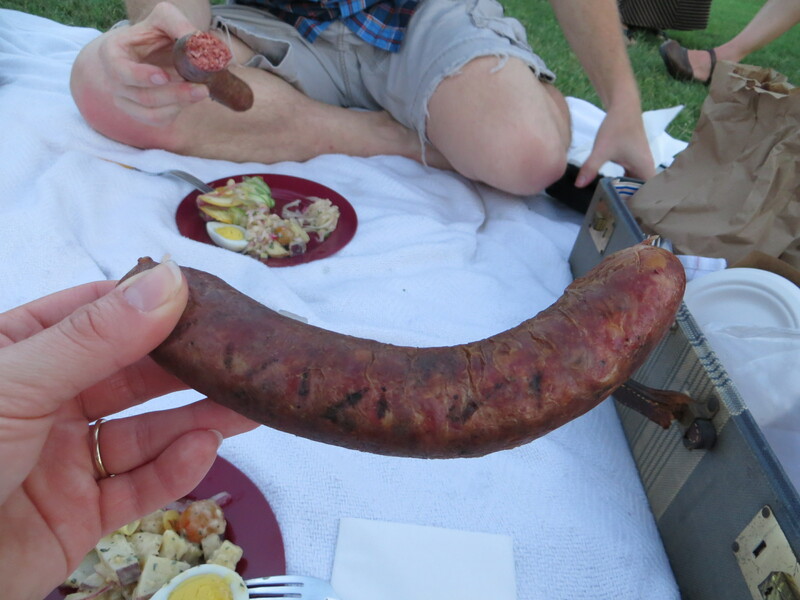 We each had an entire sausage to ourselves, and we were told they had been made with wild Texas boar and cold smoked by The HGR Team specially for the picnic. Sometimes I find the smokiness of smoked meats overwhelming, but it was perfectly balanced, and when combined with the homemade mustard sauce, the sausages almost made me think the meal couldn’t get any better. Then we opened the bag of fried chicken, and that thought quickly flew from my mind. 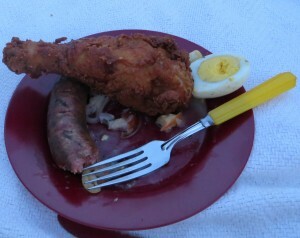 The chicken, which was sourced locally, was absolutely delicious. It was full of flavor and perfectly juicy, and the breading was unlike any I’ve ever had. It was crispy with just a hint of sweetness. For dessert we had mini angel food cakes topped with blackberry jam made from Springdale berries. By this point in the evening it was fairly dark out, and I couldn’t resist swiping a second cake. We reclined on our blankets, bellies full and hungers satiated, and basked in the cool night and the soft glow of the lights of downtown Austin. 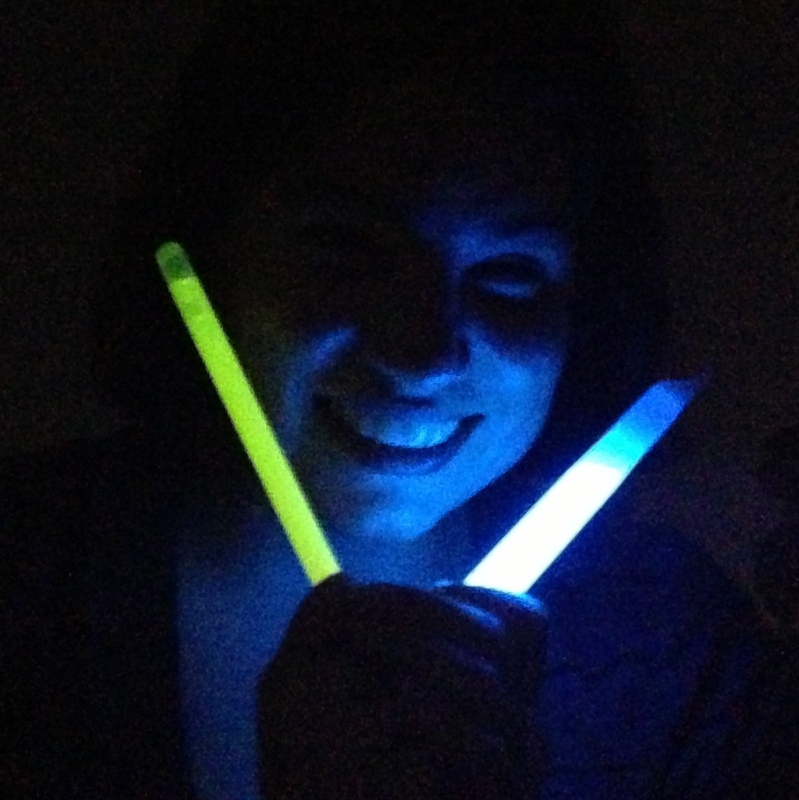 And since APD would have likely frowned on us lighting a huge bonfire in Butler Park, The HGR Team passed out glow sticks. We laughed and waved them manically in the air to usher in the solstice, to say good-bye to the spring, and to scare away any Faire Folk who may have been lurking in the bushes nearby. EDIT: Just a quick update. The HGR Team kindly posted the recipes for several of the dishes. But there’s one caveat if you wanna successfully make these dishes: You have to eat them with friends.